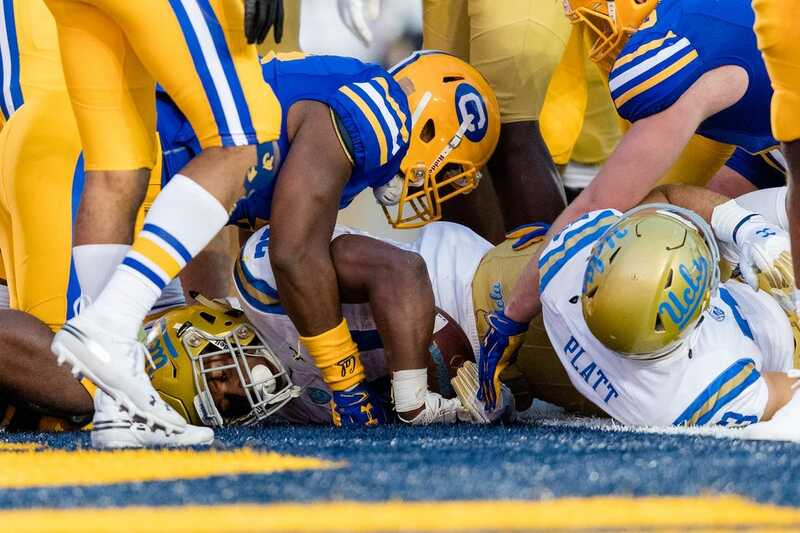 Chip Kelly recorded his first victory as the UCLA football coach Saturday night when Joshua Kelley rushed for a career-best 157 yards and three touchdowns in a 37-7 Pacific-12 Conference victory over host California. Dorian Thompson-Robinson completed 13 of 15 passes for 141 yards and rushed for 27 yards, helping the Bruins (1-5, 1-2) outgain the Golden Bears (3-3, 0-3) 348-307 en route to the victory. The Bruins were aided by five Cal turnovers, including an interception, a fumble recovery and a forced fumble by linebacker Keisean Lucier-South. The junior returned a fumble by Cal quarterback Brandon McIlwain 38 yards for UCLA's final score. Kelly, who went 46-12 in five season as Oregon's coach, recorded his first collegiate win since leaving the Ducks in 2012. He went 28-35 in four NFL seasons -- three with the Philadelphia Eagles and one with the San Francisco 49ers -- from 2013-16. Kelley scored on a 5-yard run in the first quarter and JJ Molson converted 25- and 29-yard field goals in the second period, giving UCLA a 13-0 halftime advantage. Cal got within 13-7 after driving 75 yards in 12 plays to start the third quarter, with Patrick Laird plunging in from 1 yard out. But UCLA responded immediately with a six-play, 83-yard drive, with Thompson-Robinson connecting with Theo Howard for 24 yards and later running for 15 yards to set up Kelley's second touchdown, a 1-yard run for a 20-7 lead with 6:03 left in the third quarter. Kelley's third score, another 1-yard run, put the Bruins in complete control at 27-7 with 13:36 left in the game. Laird ran 17 times for 94 yards and one touchdown for Cal, which lost its third straight after a promising 3-0 start. McIlwain went 22-for-40 passing for 168 yards, but was intercepted twice. McIlwain's second interception, picked off by linebacker Krys Barnes, set up Molson's third field goal, a 42-yarder that produced a 30-7 lead with 7:04 to go. Lucier-South's score came 66 seconds later, made possible by a sack by defensive lineman Odua Isibor that forced a McIlwain fumble. UCLA had no turnovers en route to snapping a 12-game road losing streak.